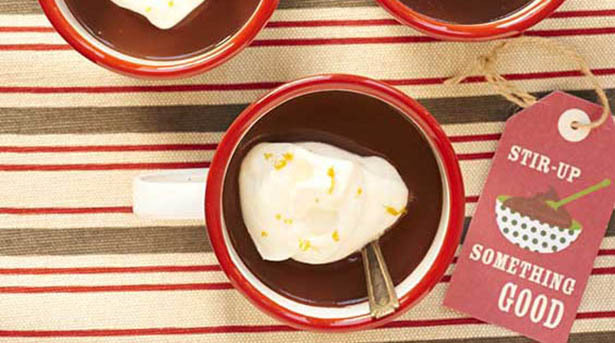 During the holidays, add aromatic flavor to your mugs of hot chocolate with cinnamon, allspice, and orange peel. Cut the skin off 1/2 orange and remove the pith. Thinly slice orange peel and set aside. Pour low-fat chocolate milk into a saucepan and bring to a simmer over medium heat. Add sugar, cinnamon sticks, allspice and orange rind. Remove from heat, cover and let stand 10 to 15 minutes. Add chocolate chunks and cook mixture over low heat 3 to 5 minutes or until chocolate melts. Carefully pour mixture through a metal strainer to remove spices. Stir in vanilla. Pour into individual mugs and top with whipped cream and additional orange peel, if desired.